A baseball lover's dream, combining superb essays, a comprehensive history of the sport, and more than 800 photos with captions. 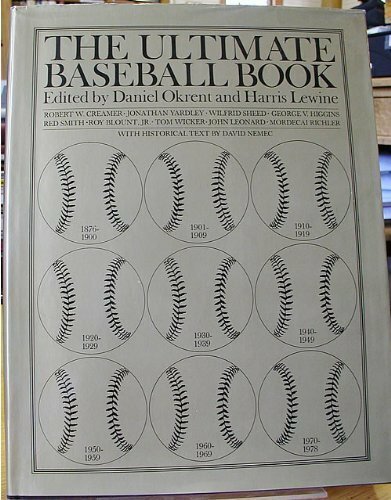 With a line-up of essayists that includes Red Smith, Robert Creamer, Wilfred Sheed, and Tom Wicker, this coffee-table volume, which separates the game's rich history into decades, reached all-star status the day it debuted almost 20 years ago. It is literate and literary, but so are many of baseball's best books; no other one connects its words with its hundreds of photographs in such an elegant double-play. Daniel Okrent is an editor-at-large at TIME, INC., and has published four books, including the best-selling BASEBALL ANECDOTES and NINE INNINGS: THE ANATOMY OF A BASEBALL GAME. The author resides in New York City.